The factory finish is very…unfinished. I am wanting to get this thing as close to "like new" as possible but I am seriously leaning towards Zolatone for the interior. Some drift boat builders use this stuff anyway. It will hide up any rough body work and it looks really good. It has to be sprayed with a pressure pot, which I have. Im liking the "Silver Gray". Am I the only one that regularly checks in on this thread for updates? I am not one for reality TV (and cancelled all but basic cable, much to the disgust of my kids) but this story holds my interest. On a similar vein, I am driving my beater duck boat down to Alabama this weekend, leaving it there, and picking up my River Hawk that I bought a few months back. I plan to switch out the motors, so the River Hawk will have an old 20 HP that seems to run well. (I bought the boat to get the motor). Still, I hope to re-power with a Honda 20 HP sometime soon. Thanks for watching! Its going to get real interesting very soon I promise. 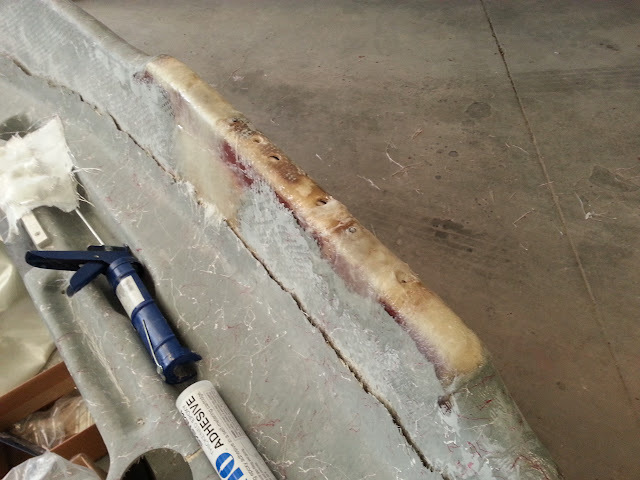 I am just about ready to start grinding and glassing the interior panels that have broken away from the hull. It should make for better photos. The last two weeks or so I have been busy glassing in all the cracks and holes along the top of the rolled gunnels. Do you basically have a complete hull again now? Super cool thread … enjoyed reading everything so far. Seems like a pretty big project. How many total hours do you estimate it will take? Yes. I still have to flip it over and repair the numerous gel coat chips but there are no major fiberglass reapirs to be made. Thanks! I am enjoying working on it. You have to be touched in the head or just enjoy the hell of playing with fiberglass to do something like this. I would say by the time its totally finished I might have around 60 hours in it. I have been working at a pretty casual pace, once it starts moving into the paint prep / actual painting phase it will go quick as that is what we do professionally at the shop. If you are interested. I have a friend that lost a boat on the Yakima. Went down the river one day and had a clean run. Next day went down the river and there was a sweeper across the side channel he ran. Was not there the day before. Lost the boat, gear, etc. Went in a week or two later with friends and recovered boat. Total loss, and insurance paid for it. Just wondering if same boat. Possibly interesting history for you. Boom! We were talking about this last night, George. That is awesome, and I would love to know more. 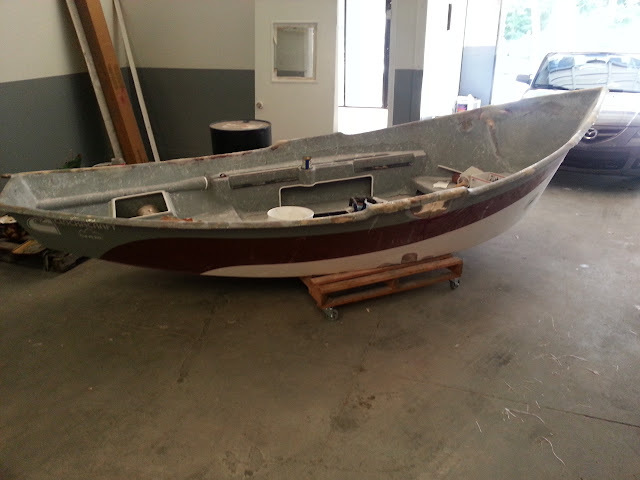 Was your friends boat a gray, white, and burgundy 2013? All I know about it is that it was an insurance total loss and that it sank. How did they recover it? I will inquire and see if that was his. He was guiding two clients. Hitting the tree was inevitable. His clients climbed to shore on the tree with most of their gear. They lost some rod tubes. He lost way more then them. I believe a river rescue team came in and picked them up. The boat wound up downstream, upside down, submerged and partially buried in gravel. The insurance company would not pay unless they recovered. He received permission from Indian Reservation to get on land, got long ropes, and pulled out of river. It was a total loss. It is a small world. I will touch base with him and see if that is his. Jay you should throw us up an update photo while you’re at it. The hull’s done, right? That sounds pretty scary, glad they made it out OK. This has to be that boat. Let me know if you get a hold of your friend. I wouldn’t say that. Its getting there for sure though. I wish I could have it at the house this weekend to work on but I definitely wont be around the shop for the next 3 days. I didn’t get a whole lot done this week but I did repair this area where the oar locks go. Looks a little rough now but it damn is it strong. I used 2 or 3 layers of woven mat and 2 more layers of chopped mat with epoxy thickened with micro fibers. I have to try and figure out how to repair these 2 spots on the stern. I want to try and keep the factory look. Still scratching my head on this one. It’s hard to tell what’s going on from the picture but maybe block it out with foamboard and wrap to that? I was just asking about his thread today! I’m tuned in to follow your updates Jay! That’s a good idea. I could glue a couple pieces together into a kind of pyramid shape and sand them down into a curve, then use that as a mold. Jay- Not my buddies boat. His was green and white. But based on northwest location I would have bet it was his. Good luck with the rebuild. Looks like you know what you are doing. Thanks. That’s interesting, thanks for checking. I still think there has to be someone out there that knows what happened to this thing. Work has kept me pinned down the last couple weeks so I haven’t had the chance to work on the boat much. I have finished glassing in all the damaged gunnels though. I ordered the front casting deck from Clacka, which they said will be made from scratch. It will need to be glassed in and will add a lot of strength and rigidity to the bow. Once that’s in place and I repair a few areas on the interior panels, it won’t be long before the interior is ready for paint. 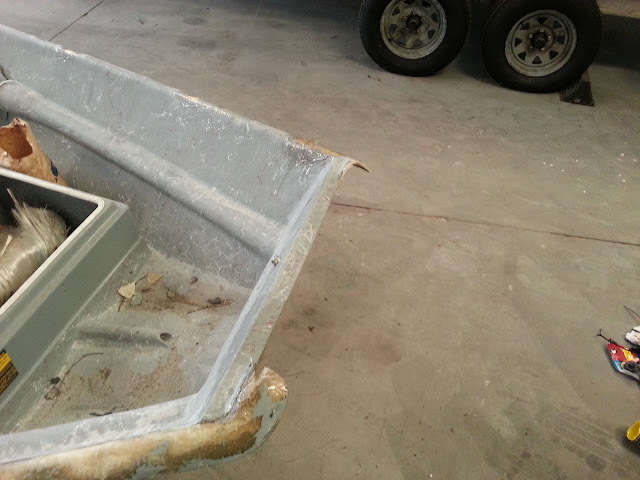 In the meantime, I managed to pick up a decent pair of oars AND a galvanized drift boat trailer locally. Got a killer deal on both. I had planned on building one myself but couldn’t turn this offer down. 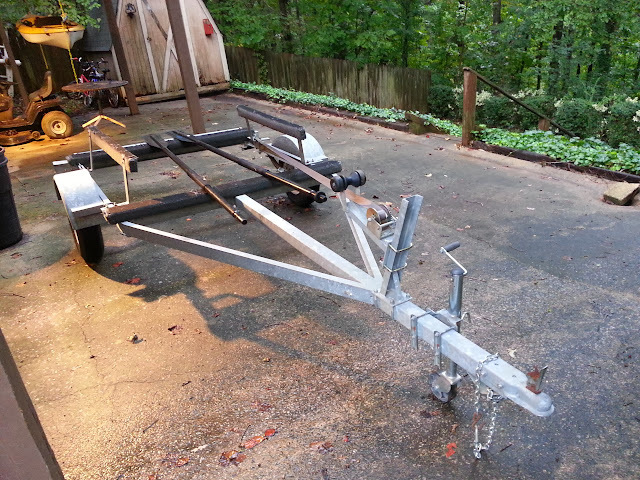 The trailer is in awesome shape and now I can bring the boat home to work on. Monday should be quiet at the shop so hopefully I can get some sanding done.